I made this recipe for stir fry tofu and cabbage on Sunday…in the dark because we lost power in an ice storm…and it was so good we finished the whole thing! It’s low calorie, plant-based goodness that’s deceptively easy to make once you plan ahead to prep the tofu. It’s even yummy for tofu haters! Okay, okay – you’re wondering how on Earth tofu managed to worm its way into my shopping cart. Long story short, we’ve embraced this nutritarian diet wholeheartedly. Our family doctor recommended it to us last fall to help with myriad health conditions and the more I have researched it, the more I believe in it. Better still, the closer I follow the diet, the better I feel. ‘Nutritarian’ is a word coined by Dr. Joel Fuhrman, MD, author of Eat to Live and The End of Dieting and many other books. His theory, based on many years of research and practice, is that we must eat more nutrient-dense food and primarily plant foods. Our bodies need not just macronutrients like protein, carbohydrates, and fats, but the micronutrients found only in plant foods. We gradually phased a lot of meat out of our diets, keeping three meals a week with animal products but the remainder of the week plant-based meals take center stage. I found the original recipe for “Sesame Napa Cabbage” in The Cook’s Garden, the wonderful cookbook I stumbled across in my local public library. It’s out of print but you can find copies on Amazon. The recipe for sesame cabbage sounded good, but needed something more. I was intrigued by the use of napa cabbage, a vegetable I had seen many times in the grocery store but wasn’t sure how to use in recipes. A little more research into both napa cabbage and the proper way to cook tofu helped me make this dish a success. Tofu has the reputation of being soft and spongy, and in truth, the reason we didn’t think we would like tofu was because so many times in Chinese restaurants we had tofu in dishes that was like eating an uncooked oyster. Yuck. The way to get tofu to be crispy on the outside with some taste is to dry it thoroughly before use. To make it in this recipe, for example, you should buy extra firm tofu and cut it into slices and squares BEFORE cooking it. Press it with a weight and paper towels (I weighed it down with a cutting board over the paper towels and a 5-pound can of coffee on the cutting board) and change the paper towels to mop up the liquid. I did this about an hour before cooking the tofu and it got out enough liquid so that it cooked well in the wok. This recipe also calls for napa cabbage. 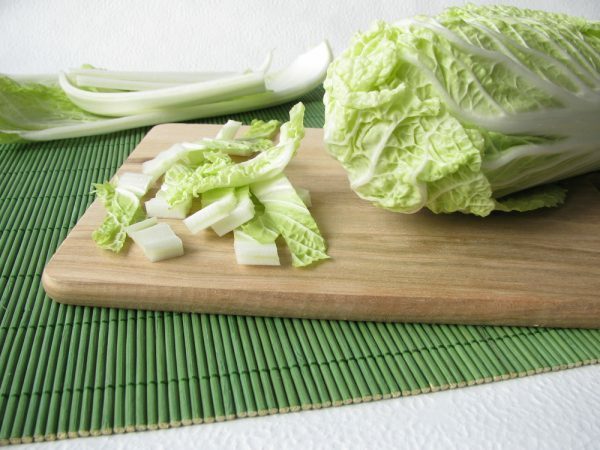 Napa cabbage is also called Chinese cabbage. It’s a white, thin, lettuce-like cabbage that when cooked actually does look (and taste) somewhat like lettuce. We used to think it WAS lettuce in Chinese vegetables! I enjoyed the taste so much that I’ve been cooking the leftovers and mixing it into salads. That’s the beauty of this cabbage; you can eat it raw or cooked and it tastes different. It does not have a strong cabbage-like flavor but when cooked tasted a little like a sea vegetable, which is interesting. 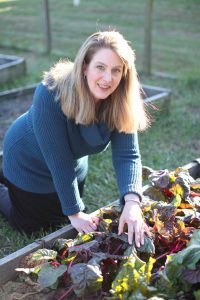 I am looking into growing napa cabbage in the garden this year because I liked it so much! It’s a great vegetable high in vitamin K, vitamin C, folate, and many antioxidants yet low in calories. An easy Chinese food recipe to make at home. You can use a heavy duty nonstick skillet or a wok. I made this in the wok. Be sure to prep the tofu ahead of time (at least an hour) to make it fry up better. Prepare the tofu at least 1 hour ahead of time. Slice the block and then cut the slices into cubes. Arrange cubes onto paper towels on a plate. Put paper towels over the top. Weigh down the top with a flat object (I used a wooden cutting board and a coffee can on top). Change the paper towels at least once to blot up excess water. Let stand for 1 hour. Remove the tofu from the paper towels. Add it to a bowl with the cornstarch, salt and pepper. Toss to coat with cornstarch. Slice the mushrooms, cabbage, celery and garlic. Keep each separate and set aside. Heat 2 tablespoons of oil in the wok. Add the tofu. Cook for 5 minutes on one side, flip, and cook an additional 3-5 minutes until tofu is evenly browned. Remove from the wok and set aside. Heat another 2 tablespoons of oil and add the mushrooms and celery. Stir and cook for 2 minutes. Mix rice vinegar, soy sauce and garlic. Add napa cabbage to the wok. Add liquids. Stir and cook for 2-3 minutes. Add tofu back to the wok, stir to warm it again, then remove from heat. Enjoy immediately.